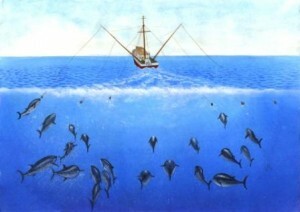 Artist’s conception of tuna trolling operation. Lines bearing baited hooks or lures are towed through the water by a slow moving vessel. In trolling, lines bearing baited hooks or lures are towed through the water by a slow moving vessel. As with any hook and line fishing method, fish are caught when they snap at baited hooks which then become embedded in the fish’s mouth or elsewhere. Hooking is stressful to fish, as discussed in rod and line fishing. Troll-caught salmon have been shown to be severely exhausted when landed. Hooking can also result in severe injury, as discussed below. As with all forms of hook and line fishing, sometimes fish are gaffed (i.e. impaled on a hook) to bring them abroad and sometimes live fish are used as bait. These practices are likely to cause considerable additional suffering. As with rod and line fishing, conservation groups consider trolling to have low levels of bycatch relative to other major fishing methods. Bycatch fish can be released quickly. As discussed for rod and line fishing, levels of hooking injury, and the survival chances of released bycatch fish, are affected by the type/size of the hook/bait and the method by which the hook is removed. One study looked at death rates for Chinook salmon that had been caught off Alaska by trolling, and subsequently released as bycatch. It found that many troll-caught fish become hooked in locations other than the mouth. The study found that this increases the likelihood of fatal wounding, especially if the gills are damaged. For fish hooked through the gills, 85% died. Nearly a quarter of the fish, 23%, were hooked through the eye, of which 21% of them died within 6 days. The same study found that smaller fish may cope less well with being hooked than those of legal capture size. An earlier study of the same fishery found that the hooking location seemed to be affected by the type of lure.